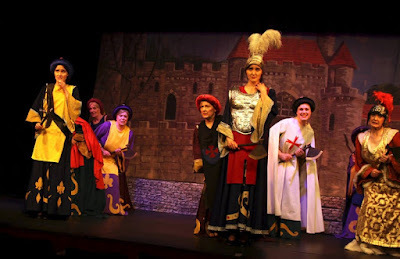 As you know, we regularly have our performances critiqued by Nova Horley our local NODA rep. We now have the Princess Ida crit and it's very complementary. If you'd like to know more about Nova and what she does in her capacity as our NODA rep, you can visit her website www.n-ovation.co.uk. 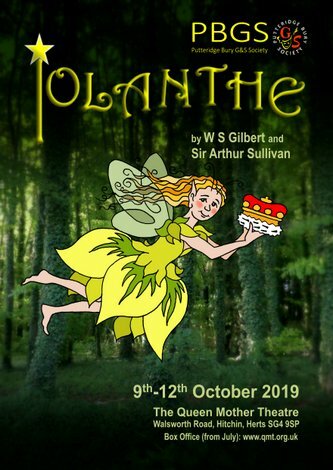 I really enjoyed this production, the overture was put to good use with a nicely thought out and executed ballet choreographed by Gordon Hodges, which got us into the mood of the production. Alison Gibbs brought out so much humour, it put the production on another level for me, and I chuckled my way through, with the many topical references and different characterisations. Being in 3 Acts made it quite a long evening, and it would have been nice to have had a note in the programme as to how long each interval would be – then the audience could have decided which one they wanted to avail themselves of, as there was some confusion to start with, and I think that made the interval unnecessarily long. Costumes were very colourful and looked good – a small note for the men – their first costumes would have benefitted from them wearing the tights they wore with their second costumes, as short black socks did not look good! I liked the ladies wigs and hairstyles with their first costumes, and the headdresses with their second, creating a very different look – which helped the plot along. I was a little perplexed by Princess Ida’s dress, it seemed very plain and not in keeping with the style of the other ladies dresses, and just struck a rather incongruous note, it looked much better with the green tabard in Act 3. The backdrops were almost fantasy-land in look, but were very pretty and I particularly liked the single blue lighting used in Act 2 Finale, and for Princess Ida’s song in Act 3 which changed the colouring of the backdrop completely, along with Ida being in a spotlight, creating a very good atmosphere, as did the pink lighting in the opening of Act 3. Lighting generally from Alan Bailes was nicely conceived and enhanced the production look and feel. I liked the lighting for the fight too. Sound is never a problem at the QM – as no visible mics are used, and the band is heard as is, with no additional amplification that I could see. Margaret Johnson had worked well with the cast to get some nice harmonies, and different expressions into the music, which helped make it seem fresh and interesting. Paula Fraser again showed her accomplishment and understanding of G&S with her portrayal of Princess Ida – good relationships with the other cast members, and moments of tenderness with Hilarion, which contrasted well with her rather warlike tendencies otherwise. I loved Hilarion as played by Gordon Hodges, I am aware that he was working under some difficulty, but it didn’t show, and he couldn’t have done more to bring this character to life. The slightly camp and balletic interpretation worked well with Florian and Cyril, making them a nicely diverse trio. I thought Gordon also showed his very good singing voice off extremely well, with expressive elements and good phrasing. Florian was the more mature and robust member of the trio, played very well by Stephen Hoath, trying to curb the eagerness of Hilarion and Cyril – I enjoyed his interpretation and singing. Joe Emler was a super enthusiastic Cyril, such energy, which added so much to what could have been a rather insignificant character – a good all round portrayal, delivered with gusto. David Crew played King Hildebrand, bringing his usual gravitas and understanding to the role. Beautifully sung, and well-acted. I liked the movement in his first number with the chorus. Paul Kerswill gave King Gama an almost Shakespearean Richard III look – and a very mean character – which sat well against Hildebrand’s very upright stance – again creating good diversity. I loved the trio of soldiers, played by Ian Boughton, Barny Shergold and Peter Johnson – it must have been such fun (although a little restricting in the suits of armour) to have played the parts, and their first song was particularly funny. Their chains needed sorting so that they actually looked is if they were being restrained, but otherwise it all worked well. Jo Bigg created a lovely Lady Psyche, soft and interesting, whilst Margaret Snape was the strict and conniving Lady Blanche – I loved the way she manipulated her cloak so that she exited with a flourish after her Act 2 number, the tin hat with the a sparkling ornament also created a good look! Lovely to see Emma and Katherine Crew on stage with their father, and creating two charming but different characters in Melissa and Chloe. I liked Katharine’s very warlike facial expressions, and Emma’s delightful smile. Nicole Santelmann maintained a good accent as Sacharissa, whilst Ketina Orriss was an appealing Ada. The ensemble including the dancers, were very well rehearsed, and their faces showed their enjoyment, which isn’t always evident in G&S, with Alison Gibbs creating simple but effective choreography for the cast. 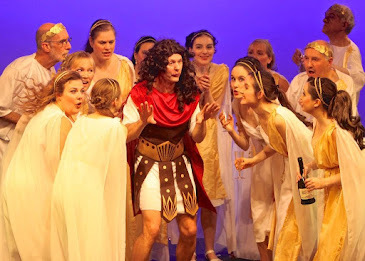 Overall a very enjoyable evening – a good production with loads of humour and interest. My thanks to PBGS for their hospitality, always good to catch up with society members.